The eighteenth-century Seneca chief known as "The Half King" is a figure so obscure that no one knows his real name - it was most likely Tanaghrisson, or something close to it. Tanaghrisson stepped into American history in 1748, when the Iroquois League designated him leader of the Senecas and Delawares. 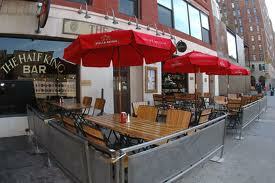 The hip gastro-pub sporting his namesake located at 505 W. 25th Street has become a fixture in Chelsea. Just celebrating their 10th anniversary, this awesomely comfortable and fun space with elegantly worn, wide-plank wooden floors and a revolving art collection has an ambiance that is buzzing with energy. 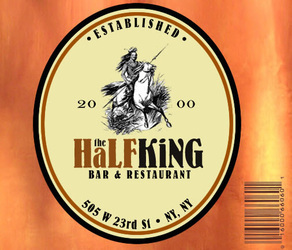 The Half King hosts about 50 literary events a year and their weekly Monday Reading Series has become a Chelsea institution. Graced with exposed brick walls, a thirty foot bar and an intimate back garden, there is something for everyone. We chose to dine in the semi-private lounge with leather couches and dining tables that rest just above your knees, creating an intimate setting and a very relaxed atmosphere. With water served out of clear wine bottles and a staff whose interest in astrology is as apparent as their passion for food, hipster chic is at play. Chef Gregory Beumel and the Thrill Grill Kitchen Crew serve up fare that is defining New American Cuisine. However, it was the interesting cocktail menu that got us started as the Sazerac Rye Manhattan and the Ginger Snap Cookie (Domaine Canton, Bailey’s, butterscotch and a splash of peppermint) provided a seasonality that was appropriate on this cool fall night. 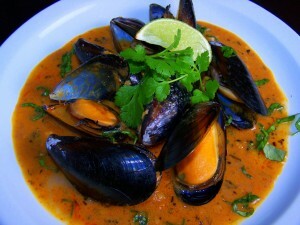 We delved into the innovative menu with the Fresh White Water Mussels with Curried Coconut Milk and the traditional Fried Calamari, which was graced with a sauce that was actually quite moving. With compliments to the chef and excited at this beginning, we ordered up a glass of the Blue Point Blueberry Ale and the delicious Ginger French Martini (Stoli, gingersnap liqueur and Grand Marnier) accompanied by an order of the Sweet Potato Fries. Served with chipotle mayo this simple yet incredible snack transported me to the deep South as the sweetness of the potatoes wrestled with the spiciness of the dipping sauce and created fireworks on my palette. Next came the big plates—a briny traditional Paella, a killer Mac and Cheese dressed with shards of parmesan and the Shaved Fennel, Baby Arugula and Blood Orange Salad (with sweet roasted walnuts and a fresh lemon thyme vinaigrette). All delicious and thoughtfully prepared, the eclectic blend of inspiration and culinary expertise delivered a very satisfying experience and one that provided fun memories. With Influences that range from traditional American pub food, to Italian, to Spanish, the Half King is clearly participating in defining the direction of American cuisine.